What do armadillos, leprosy and Ebola have in common? The world runs on strange coincidences, which have been cropping up a lot around here. For me, leprosy has been one of those coincidences. I was cataloging a DVD on a Catholic priest who worked on a leper colony in Hawaii in the early 19th Century (both the island and the DVD are called Molokai, if you’re interested). 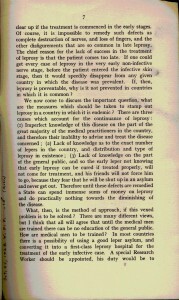 While searching for some information about the island I stumbled upon some more general information about leprosy, including three facts I found really interesting: leprosy can be transmitted to humans by armadillos; armadillos fall into the Levitical category of ritually unclean; and 95% of the population is naturally immune to the bacteria that causes the disease. 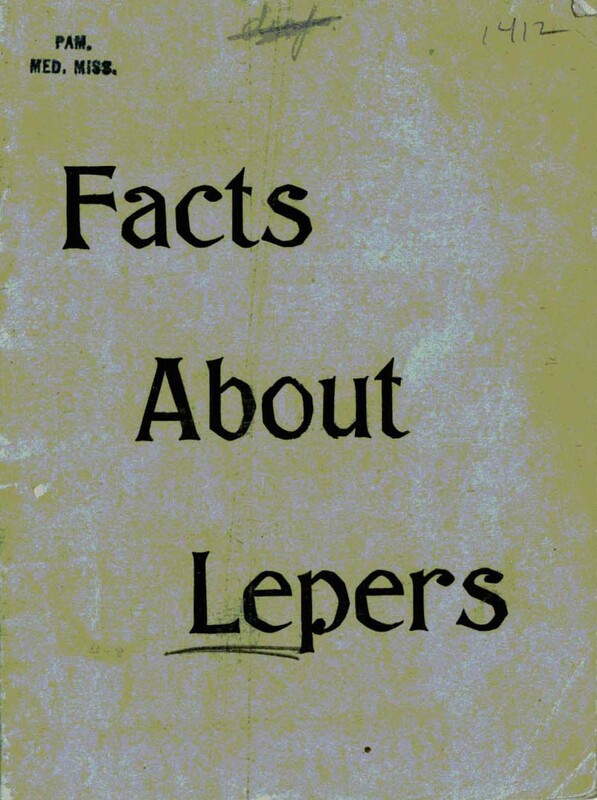 “Facts about lepers,” 1880; Missionary Research Library Pamphlet Collection, #1412, Burke Library at Union Theological Seminary, Columbia University in the City of New York. I posted these facts to Facebook, which inevitably led to a coworker mentioning that we’d had an unusual number of requests for pamphlets on missionary work with lepers lately from the special collections. Of course we had, why wouldn’t the week that I work with some random movie about Christian missions in leper colonies also be the week that two separate researchers ask for materials on the same exact thing? This inspired me to write a blog post about leprosy and some of my immediate thoughts and reactions to the requests for these materials. I am thoroughly fascinated by Leviticus, and like many scholars, am often dumbfounded by the seemingly prescient food prohibitions in chapter 11. Many of the animals prohibited by YHWH turn out to be dangerous when cooked improperly, notably pigs and shellfish. The discovery that armadillos also fall into this category (which is translated as both “detestable” and an “abomination”) was now coupled with the fact that they cause leprosy, a disease that Leviticus 14 discusses at great length (seriously: how to deal with this kind of leper, with that kind of leper, what to do if your house looks like it has leprosy…). There is always a danger in ascribing too much foresight into the minds of ancient people, and the numerous attempts to find focused cohesion among all of the Levitical prohibitions have always fallen flat. In addition, it should be noted that as far as I can tell there were no armadillos in the Ancient Near East. However, I also think that there is danger in ascribing too little comprehension to ancient people. It’s reasonable to assume that they realized that eating certain types of animals made people sick sometimes and that generic categories were created to avoid eating as many dangerous animals as possible. The categories weren’t created in the same way that we would today; for most of us the requirement that an animal have cloven hooves and chew its cud in order to be edible, or the prohibition against “anything that creeps,” seems like a strange line to draw. It is also important to remember that Leviticus is, at it’s core, a text dedicated to sorting out ritual purity from impurity, dedicated to creating categories and boxes in order to sort out the various roles and responsibilities of the various parties involved. YHWH, who had just freed the Israelites from Egypt; the priestly community among the Israelites, who were now responsible for maintaining positive relations with a deity who had already proven quick to anger; and the lay Israelites, who stood a good chance of ruining everything for everyone. This is perhaps part of why the book spends so much excruciating detail covering leprosy and leprosy-like diseases. They were physically-manifested aberrations that cropped up in a world that mapped cosmological ramifications onto the physical world, that had no apparent method of containment other than exile from the community, and that could therefore only be manifestations of some spiritual defect. “Information please,” 1954: Missionary Research Library Pamphlet Collection, #1347, Burke Library at Union Theological Seminary, Columbia University in the City of New York. Concerns about and treatment of leprosy within ministry continues to this day. Burke Library is home to many materials about this topics, most notably in our Missionary Research Library (MRL) pamphlet collection and periodical collection. 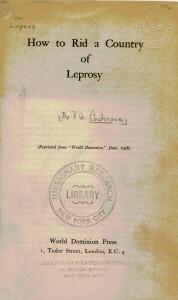 “How to rid a country of leprosy,” 1926: Missionary Research Library Pamphlet Collection, 1346, Burke Library at Union Theological Seminary, Columbia University in the City of New York. 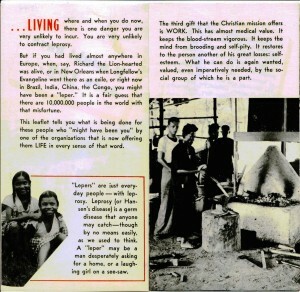 “It might have been you,” 1950: Missionary Research Library Pamphlet Collection, #1344, Burke Library at Union Theological Seminary, Columbia University Libraries in the City of New York. Burke has materials dating from the early-19th Century to present-day that deal with ministry to lepers and information about the transmission of the disease. It struck me that we were getting requests for these types of materials in the middle of the most recent Ebola hysteria. The images below are just selections from our impressive amount of materials on the subject (over 200 individual titles), some of which eerily echo the current attempts to frame the discussion about Ebola and its transmission in its larger global context. Both create(d) hysteria and fear in populations where little was known about how it spread, how contagious it actually was, or even what the disease itself actually was. “Akeva: the story of missions in Africa,” 1954: Missionary Research Library Pamphlet Collection, #1345, Burke Library at Union Theological Seminary, Columbia University Libraries. 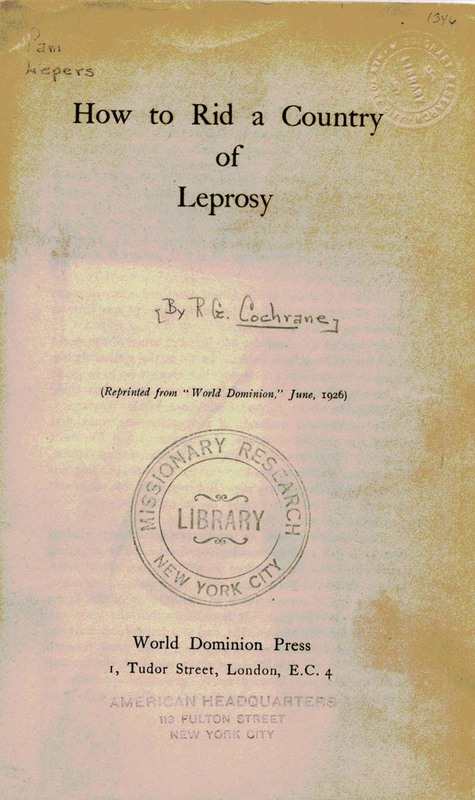 They also created similar hysteria in populations with widely available information about the disease, hence the need for pamphlets reassuring people that they are unlikely to catch leprosy themselves (see below). The drastic difference in the availability of effective treatment and even cultural and institutional circumstances create(d) a painfully visible dichotomy between those who are/were affected and those who are/were not. The massive disparity in occurrences between the developed and developing world also contributes(d) to stigmatization and stereotyping of affected populations, both by those demonizing the victims and by those trying to help. The legacy of Christian missions in foreign lands is always a difficult one, one where undeniable good is often born out of a conversion/”saving the heathen” mindset that many of us find uncomfortable today. The materials in our MRL pamphlet collection continuously straddle that line, and therefore continue to be relevant for scholars looking to examine various aspects of history, secular or otherwise, for these kinds of strange coincidences that sometimes power our universe. If you are interested in viewing anything from our Missionary Research Library Pamphlet Collection you can make an appointment here. This entry was posted in Collections, History on November 14, 2014 by Elizabeth Miraglia.